I'm trying to get remote screen access to my Raspberry Pi (running Raspbian) with a Mac OS X client. I ran 'raspbian-config' and used it to enable the VNC server. The desktop on the raspberry-pi shows that VNC server is running. ps says it's vncserver-x11-core. The raspberry pi shows up as a shared screen on my Mac in the Finder. incompatible with this version of Screen Sharing. Is there a config option on the Pi that I can tweak? That's my preferred approach. Failing that, will switching to tightvncserver help? It feels like a bit of overkill to update my Mac for this problem, but would it help? Either install the RealVNC viewer on your Mac, or change the authentication type on the server to "VNC Authentication" and set a suitable VNC password. The Mac viewer doesn't support RealVNC's system authentication, which allows you to login as a system user. If you need to configure accessing the pi with osx's Screen, but only have headless access to the pi, you can use a vnc config file. sudo raspi-config > Interface Options > VNC > Enable. Reboot. Copy the output of that command (eg. Password=40cca9718ffb8e91d55cf290c3db86d5 ) for the config file. Open Screen with the instructions above, and use the password you provided to vncpasswd. This is good because software like tightvncserver requires Java to run on the Pi. Java is handy but it is a processor pig and should be avoided to keep your project running as fast as possible; and if your Pi is completely wireless, to ensure longest battery life. I use a Raspberry Pi Zero Wi-Fi (rbp0w) which is a natural for going completely wireless. 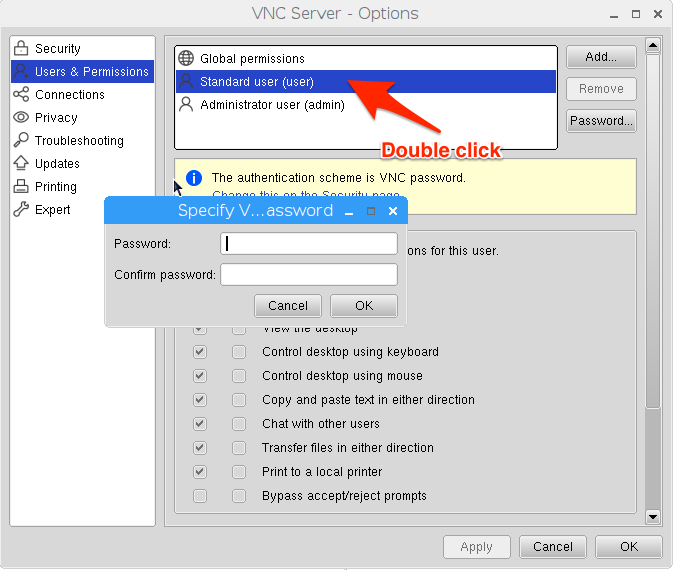 4) Select "Security" if not already selected and set Encryption to "Prefer off" and Authentication to "VNC password". This assumes your device is behind a firewall on a secure network... hence encryption can be safely turned off to ensure compatibility. 8) Press connect and you are in! You can use tightvncserver; I use this and start session with open vnc://pi@10.1.1.41:5901 on the Mac (change to your IP or use raspberrypi.local). RealVNCneeds the GUI on the Pi to be running (you can start manually, but, if so why bother) and shares the same screen. tightvncserver starts a new screen (which IMO is better, as the sessions can have different resolutions). NOTE RealVNC and tightvncserver are incompatible, and you can only have 1 on your Pi. Andrew Wedgbury and Richard Barnette comments work for OS X 10.12.5 Screenshare. 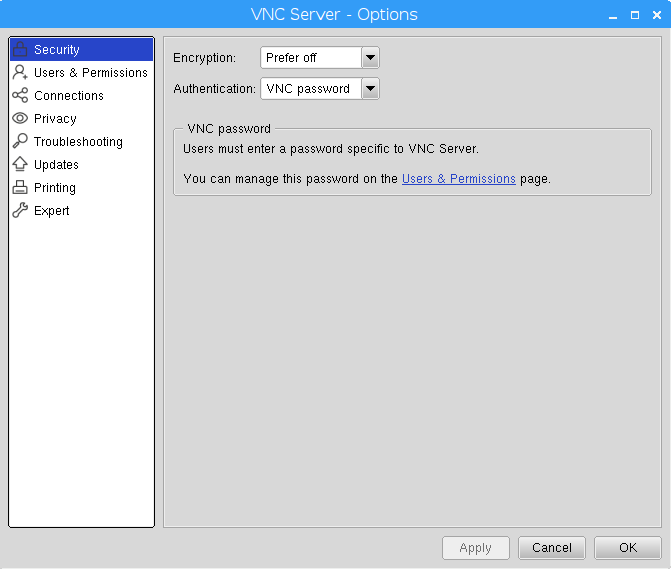 Select Authentication drop down and set to VNC password and click apply. 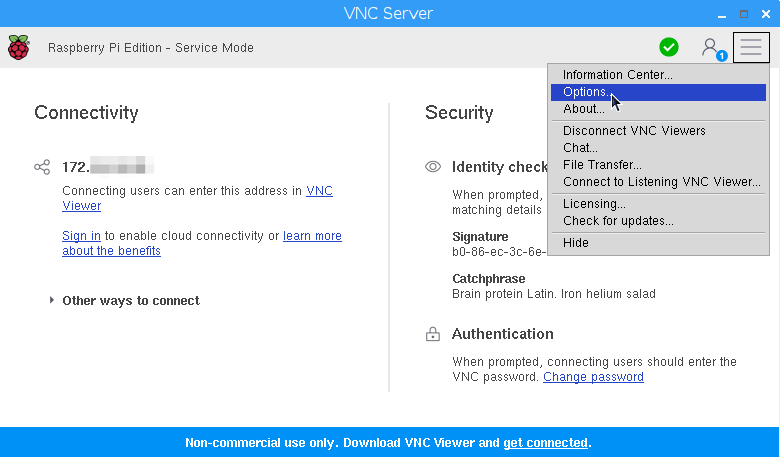 Click the link Users & Permissions in "VNC password" section below. Select Administrator user from user drop down. On OS X Sharescreen and enter raspberry.local (hostname.local), enter password when prompted. Not the answer you're looking for? Browse other questions tagged vnc osx or ask your own question. 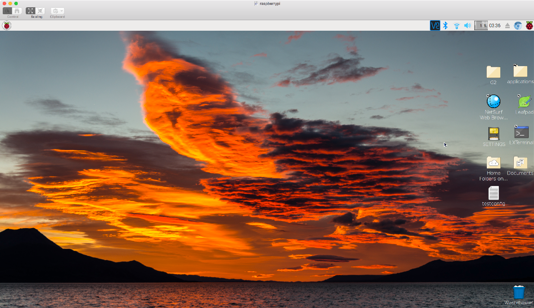 Raspberry Pi and RealVNC: required, or just a run-of-the-mill partnership?